[usage]: writing, defense, glass crushing device etc. The pen has good tactical defense functions. Nib to hit the criminals effectively, causing the temporary damage to defense. 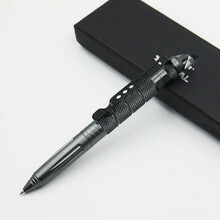 Aluminum Alloy has good hardness and willful, enough to cause temporary damage to the human body, pen design, suitable for different occasions to carry, such as: aircraft, exhibition hall, the museum will be refused to carry, become intimate partner. Tactical life pen has good tool performance. 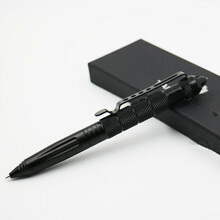 It uses high-quality ball point pen core, writing smooth, full line. 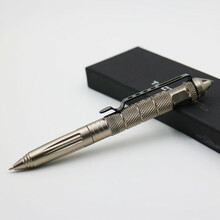 Aluminum alloy pen body, thick ore line design, fully reflects your unique taste and style of the gentleman. Surface are using hard anodic oxidation, which is only found in the high-end aluminum alloy products using the surface treatment, can protect the product for many years is not easy to wear and affect the function. For a long time and not monitored. Received. Like and hope never have to use. As described in the listing. It is a bit larger than I had expected, but that is a good thing because it is very sturdy. Great product, and excellent store. Thank you! Worth the wait ! 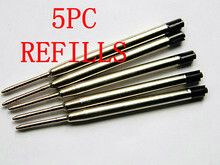 Good product, very fast shipping. Thank you. Peter came quickly, super quality!